In order to stimulate work in the area of artificial intelligence at the undergraduate level of education, SAIS has created a special yearly award for the best Master’s thesis (examensarbete) in the area of artificial intelligence. The winner will be awarded travel funds of 5000SEK, and is expected to present the winning contribution in connection with the SAIS workshop 2019. The thesis has been presented officially during the period of January 1, 2018 – January 31, 2019. An electronic copy of the thesis (PDF) and a short written motivation by the nominator should be sent to mthprize@sais.se, include the terms “SAIS” and “Master’s Thesis award” in the subject line, no later than February 22nd March 1st, 2019. The nomination should include a short motivation why the thesis should be selected as the winner, and state its contributions to AI. The SAIS board will review the nominated Master’s theses and determine a winner based on factors such as novelty, thoroughness, readability, scientific value and relevance to artificial intelligence, both with respect to research and to potential applications. The decision by the SAIS board will be final. The date and location of the SAIS workshop where the winner will present the thesis is still to be determined. See workshop webpage (sais.se/sais2017) for more information. The award goes to Thomas Rosenstatter for his thesis entitled “Modelling the Level of Trust in a Cooperative Automated Vehicle Control System”. The thesis introduces a trust system that allows an autonomous vehicle, in this case a car, to make more reliable and robust decisions by taking into account current information about its context. The system evaluates the current situation and generates a trust index, indicating the level of trust in the environment, the vehicle itself, and other vehicles surrounding it. This work was partly evaluated as part of the winning team in the Grand Cooperative Driving Challenge 2016. The thesis addresses a topic that is timely and of high practical relevance in today’s AI community. The thesis is well written and has the potential of both impacting future research in the field, and practical applications. Presentation of the thesis at the SAIS workshop will surely create some interesting discussions. The thesis was presented at Högskolan i Halmstad, and nominated by Slawomir Nowaczyk, who also examined the thesis together with Antanas Verikas. Supervisor was Cristofer Englund. The 30th Annual Workshop of the Swedish Artificial Intelligence Society (SAIS 2017) will take place in Karlskrona, Sweden on May 15-16, 2017. The SAIS workshop provides an ideal forum for contacts among AI researchers and practitioners in Sweden and neighboring countries, as well as for establishing links with related research disciplines and industry. For more information see the workshop webpage. In order to stimulate work in the area of artificial intelligence at the undergraduate level of education, SAIS has created a special yearly award for the best Master’s thesis (examensarbete) in the area of artificial intelligence. The winner will be awarded travel funds of 5000SEK, and is expected to attend the SAIS workshop to present the winning contribution. The thesis has been presented officially during the period of January 1, 2016 – January 31, 2017. An electronic copy of the thesis (PDF) and a short written motivation by the nominator should be sent to mthprize@sais.se, include the terms “SAIS” and “Master’s Thesis award” in the subject line, no later than February 5th, 2017. The nomination should include a short motivation why the thesis should be selected as the winner, and state its contributions to AI. The SAIS board will review the nominated Master’s theses and determine a winner based on factors such as novelty, thoroughness, readability, scientific value and relevance to artificial intelligence, both with respect to research and to potential applications. The decision by the SAIS board will be final. The selected winner will be announced in time for the 2017 SAIS workshop, where the winner will be expected to present their work. 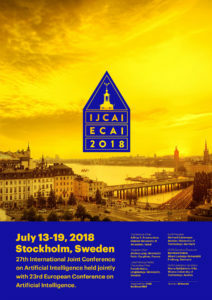 The IJCAI Distinguished Service Award was established in 1979 by the IJCAI Trustees to honor senior scientists in AI for contributions and service to the field during their careers. Previous recipients have been Bernard Meltzer (1979), Arthur Samuel (1983), Donald Walker (1989), Woodrow Bledsoe (1991), Daniel G. Bobrow (1993), Wolfgang Bibel (1999), Barbara Grosz (2001), Alan Bundy (2003), Raj Reddy (2005), Ronald J. Brachman (2007), Luigia Carlucci Aiello (2009), Raymond C. Perrault (2011), Wolfgang Wahlster (2013) and Anthony G. Cohn (2015). At the 25th International Joint Conference on Artificial Intelligence, IJCAI-16, the Donald E. Walker Distinguished Service Award was given to Erik Sandewall, Professor of Computer Science (retired) at the Department of Computer and Information Science at Linköping University. 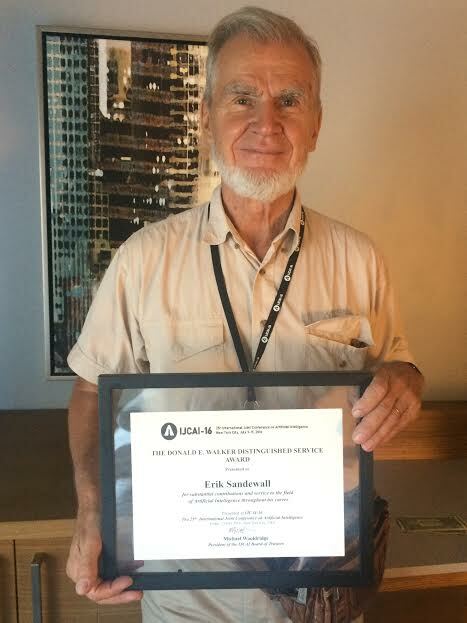 Professor Sandewall is recognized for his substantial contributions, as well as his extensive service to the field of Artificial Intelligence throughout his career. 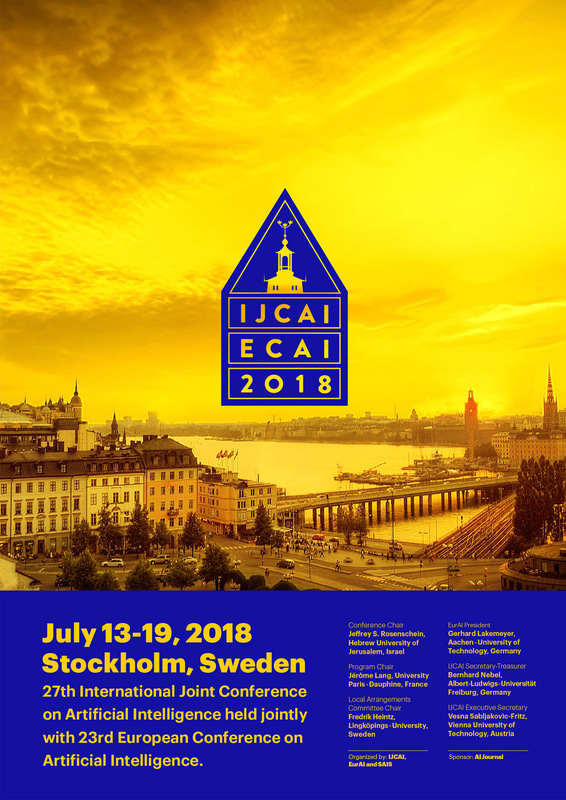 He is one of the founders of IJCAI and he served as the Editor-in-Chief of the Artificial Intelligence Journal for many years and made significant contributions to the success of the journal and to the wider dissemination of AI into the scientific community. 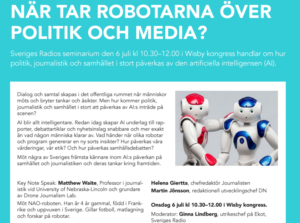 On July, 6, there will be an interesting AI Seminarium (in Swedish) / AI Seminar (in English) about robots in politics and media at Almedalen, Visby, Gotland, Sweden. 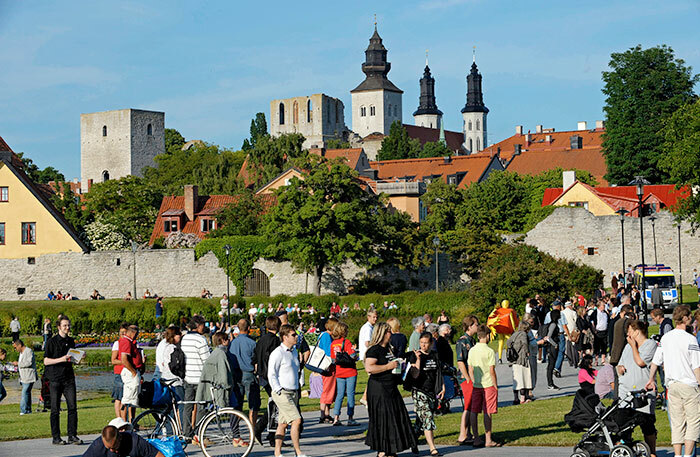 The Almedalen Week (Almedalsveckan) is an annual event taking place in Almedalen, a park, in the city of Visby on the Swedish island Gotland. With speeches, seminars and other political activities, it is considered to be the most important forum in Swedish politics. During the week, representatives from the major political parties in Sweden take turns to make speeches in Almedalen. At this event, the conversation will be about how politics, journalism and society at large is affected by artificial intelligence (AI). Dialogue and conversation are created in the public sphere where people meet and share thoughts and opinions. But how will politics, journalism and society at large be affected by AI’s entry on the scene? AI becomes increasingly more intelligent. Already today AI is creating basis for reports, articles and news reports faster and more accurately than any human can handle. What happens when robots and programs generates a new kind of insight? How are our values, our ethics changing and what are they? And how will the public debate? Meet some of Sweden’s foremost connoisseurs of AI’s discuss AI’s impact on society and journalism and their thoughts about the future. Key Note Speaker: Matthew Waite, a professor of journalism at the University of Nebraska-Lincoln, and founder of the Drone Journalism Lab. Also meet the NAO robot. He is 4 years old, born in France and raised in Sweden. He likes football, cooking and doing research on robots. Presented by Fredrik Löfgren, robot developer and Fredrik Heintz, associate professor of computer science at Linköping University and chairman of the Swedish AI Society. Posted in Artificial Intelligence, conference, Linköping University, News & Media, robotics, sverige, Sweden	| Tagged Almedalen, Artificial Intelligence, Linköping University, NAO Robot, News & Media, Robotics, sais	| Comments Off on AI debate in Almedalen, Gotland, Sweden: When will robots take over politics and media? The award goes to Frej Knutar for his thesis entitled “Automatic Generation of Assembly Schedules For a Dual-Arm Robot Using Constraint Programming”. The thesis is well-written and of high quality, and it presents a highly relevant practical application of constraint-based models for the task sequencing of a two-armed robotic manufacturing cell. The solution is guaranteed to avoid arm collisions. It is also cyclic, meaning that one arm can start the next assembly while the other arm i finishing the previous one, which results in a high throughput. The solution is related to a real-world problem where such scheduling is currently most often done manually, which requires highly skilled engineers and takes anywhere from days to weeks to complete, while the proposed solution will complete within a matter of hours. The thesis was presented at Uppsala University, and nominated by Pierre Flener, who also supervised the thesis. Industry supervisor at ABB was Johan Wessén.